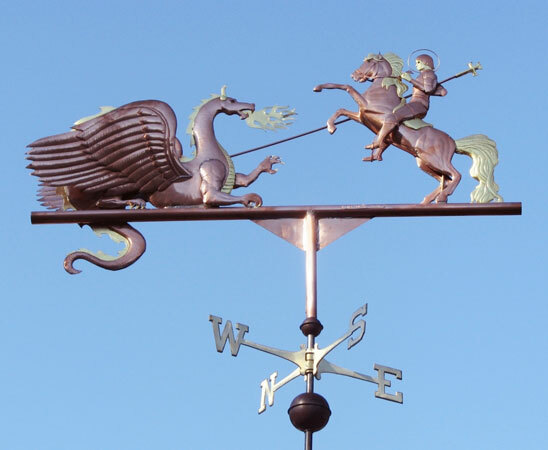 Our St. George and the Dragon Weather Vane was originally commissioned by a Yugoslavian man as a gift for his brother in Florida. Their family’s patron saint is St. George. At the time, it represented the most ambitious and challenging design we had yet undertaken. Even though it was a large (3-foot) weathervane, the knight on his rearing steed was only about a foot in size. It is far more difficult to craft small sculpture pieces than it is to make them larger because every piece is hand shaped and soldered. We have since made additional versions of this design. In addition to representing the patron saint, it has been popular with men named George. One of my favorite variations on this design occurred at an art festival where we were exhibiting our work. A man came up to our booth and ordered a small Web Winged Dragon Weather Vane as a birthday gift for his wife, who was an avid dragon collector. They had just remodeled the deck outside their living room and he was going to place it on top of the railing so they could enjoy it from inside the house. As I was writing up the order, he indicated that his name was George, so of course I had to show him our St. George and the Dragon Weathervane design. He loved it, but thought his wife might object to the poor dragon being pierced with a lance. The solution came to us both at the same time. We would make a separate small sized Knight on a Rearing Steed that he would place on the deck railing adjacent to the small Dragon Weathervane. When the wind blew in from one direction, the Knight would indeed chase the Dragon. However, when the wind shifted, it was the dragon’s turn to chase the knight! He was delighted with the concept and so, it turns out, was his wife. In fact, they later informed me that at the end of a long day at work they would come home, pour themselves a glass of wine, sit down and look out the window to see who was leading the charge that day! This design, in particular, benefits from optional gold leafing. It is especially beautiful when we gild St. George’s halo, his face and hands, the horse’s mane and tail and the spear itself. Because these weathervanes are made to order, we can work with you to create the perfect combination of materials for you. Custom copper weathervanes are part of our larger series of mythological Weathervane designs that also feature Dragon weathervanes, Mermaid weathervanes and over 50 other mythological weathervane designs. Please visit our Mythological Weather Vane page to learn more about our other Mythological weather vane designs.